Record v Charlton: P30 W8 D13 L9 - this is Charlton’s first league visit to Northampton since January, 1967, when they drew 1-1 at the County Ground in the old division two. The Addicks haven’t played at Sixfields, their most recent visit to the Cobblers being in the League Cup in September, 1988, when the teams drew 1-1 in a first-leg encounter. Charlton won the second leg on home soil 2-1. Cobblers connection: Ricky Holmes. 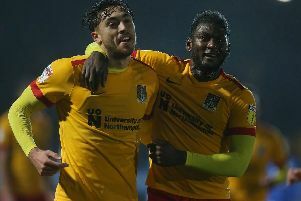 The attacker was one of the star men in the Cobblers’ dream 2015/16 season as they powered to the Sky Bet League Two table, turning in a series of matchwinning performances, and scoring some absolutely stunning goals. His decision to leave the Cobblers last summer to sign for Charlton Athletic was a big blow for the Cobblers, especially as they had given the player the chance to get his career flying again after he had found himself out of favour at Portsmouth. But as disappointing as it was that he left, the majority of Town fans understood that it was a move Holmes couldn’t really turn down and I am sure he will get a good reception from the Sixfields faithful on Saturday. Jeremy Casey’s preview: A week is a long time in politics, so the saying goes, and it can also be a painfully long time in football. This time last week the buzz around Sixfields was one of optimism and confidence, with Justin Edinburgh’s team preparing to take on in-form Fleetwood Town after claiming seven points out of the previous nine. Home wins over Chesterfield and Swindon Town had been followed up with a 2-2 draw at promotion hopefuls Southend United, and talk was of reaching 51 points as quickly as possible and a comfortable mid-table finish. Town were six points above the drop zone, and 10 points clear of third-from-bottom Swindon Town, and sitting comfortably, if not exactly pretty. Seven days later, the talk is still of reaching that 51-point target - but the mood has changed significantly. The 3-0 loss at Fleetwood was not a particular issue, as Uwe Rosler’s side stretched their remarkable unbeaten run to 17 matches as they continued their push for automatic promotion to the Sky Bet Championship. But Tuesday night’s 2-1 home loss to fellow strugglers Oldham Athletic has set the alarm bells ringing, and not just because Town are now only four points clear of a revitalised Swindon, who after two wins in the space of three days occupy that final relegation place in 21st. It was the manner of the defeat that has concerned the most. Town played okay as an attacking force and created plenty of chances but, crucially, they didn’t take them - something which is becoming an unwelcome habit. And as frustrating as the Cobblers’ profligacy in front of goal is, it is the goals flying in at the other end that are the major issue and cause for concern. Town have conceded 23 goals in their past 10 matches, and 16 in the eight games since Edinburgh took charge. And that is not good enough. As has been the case for much of this season as far as the Cobblers were concerned, Oldham were able to get in at the back four and open up clear scoring opportunities far too easily. Edinburgh spoke this week of defending better as being a collective effort, and he is right, but he and his team need to sort the issue quickly, because as it stands the Cobblers are going to have to score two or three goals per game if they are going to get the points they need to stay up. And, as they also seem to be missing chance after chance at the other end, that currently seems unlikely. The midfield seems to be the main problem area, with teams overpowering Town far too often. Edinburgh has changed the make up of his midfield four virtually every week as he tries to find the right blend, but hasn’t yet to hit the jackpot, and he has to do something about the team being far too open, and not providing the cover the back four need. One thing’s for certain, if the Cobblers allow the club’s former talisman Ricky Holmes the space to run at them when Charlton come to Sixfields on Saturday then they will be asking for trouble. Every Cobblers fan knows how good Holmes is, and exactly what he is capable of, and they will be hoping the Town players still at the club from Holmes’s spell have a few tricks up their sleeve to keep him quiet. And, if they can do that, then there is no reason why the Cobblers, despite all of their problems, can’t win this game. That’s because the south Londoners arrive at Sixfields in disarray and in worse form that Town, with Tuesday’s 4-3 defeat at Shrewsbury - despite Holmes hitting a brillant hat-trick - their third loss on the spin. The Addicks have in fact lost four of the past five, haven’t won in seven, and have only won three games in the past 18 in all competitions. Their defence is pretty leaky too, having conceded eight times in the past four games. Former Milton Keynes Dons boss Karl Robinson has failed to have and real impact on their fortunes since taking the helm, and they are just two places and two points above Town in the league one table. Indeed, if you put the Holmes factor to one side, and the fact that Charlton are a supposed ‘big club’, this match has to be seen as a great opportunity for the Cobblers to get back on track, and edge that little bit closer to securing their league one safety. With the defensive records of both teams, I imagine there is going to be plenty of goals (cue a 0-0 draw), and it’s just about the Cobblers making sure they outscore their visitors!